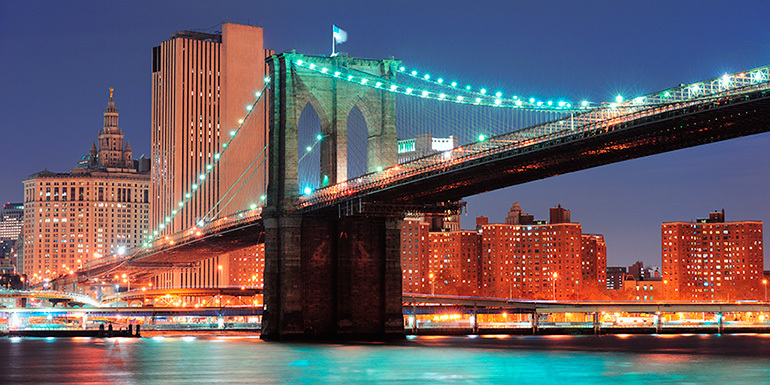 If Brooklyn wasn’t one of the five boroughs of New York City, it would not only be the fourth largest city in America, but it would also stand alone as one of the most interesting travel destinations in the country. Brooklyn is experiencing an exciting renaissance right now, and you won’t want to miss it if you’re sailing out of Red Hook. 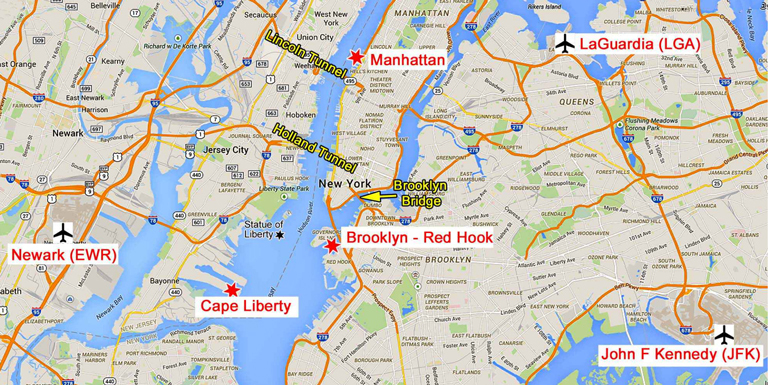 This handy map from Tom's Port Guides shows the airports and cruise ports in New York and New Jersey. Splurge: Wythe Hotel – Located in trendy Williamsburg, this newcomer is surrounded by hipsters, but its details (exposed brick walls, original timber ceilings) hearken back to the industrial period. Since the hotel is owned by the team behind some of the neighborhood’s beloved eateries (Marlow & Sons, Diner), the hotel restaurant, Reynard, is more than just that. Instead of continental breakfasts and turkey clubs, expect seasonal fare, much of it roasted in the wood-fire oven. 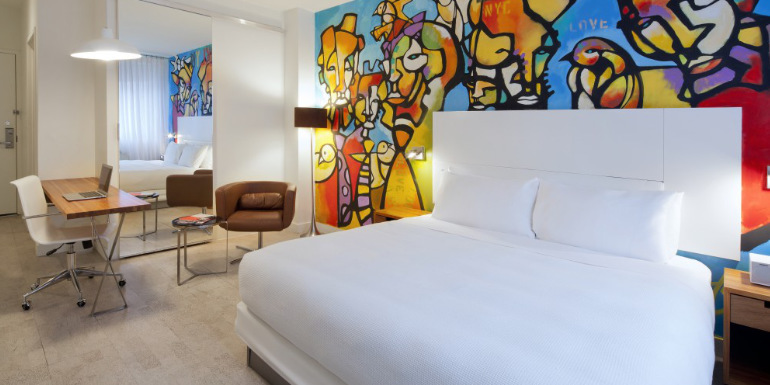 Steal: Nu Hotel – Rooms at this modern hotel are clean and simple, but the best asset the Nu has going for it is its central location, right near Boerum Hill’s Atlantic Avenue and Smith Street shopping corridors. Also not far away: a variety of subway lines that can whisk you off to whatever corner of the city you’d like to explore. Tip: If the subway doesn’t go where you’re headed, don’t plan to flag a cab… it may never come. Ask your concierge or waitress to call a neighborhood car service for you. The cars themselves tend to be beaten up, but the wait is short and the price is right. Breakfast: Buttermilk Channel – Brunch is big in Brooklyn, so expect to wait for a table anyplace that’s worth a visit. Buttermilk Channel is no exception… but here, you’ll be glad you didn’t give up. The pecan pie French toast, topped with a bourbon-molasses syrup, is the star of the sweet options, and the mimosas are great — not that we’re telling you what to order or anything. Dinner: Roberta’s – While we would never tell you to skip Brooklyn’s pizza mainstays (Grimaldi’s, Totonno’s, Di Fara, L&B Spumoni Gardens), you won’t have time to visit them all. If we had to pick just one, we’d spend our time at Roberta’s, where we love the atmosphere as much as the pizza. The menu includes gorgeous sweetbreads, several fantastic pastas — including one topped with garlicky Littleneck clams — and squid with Meyer lemon and chili, but we don’t get to come here enough to move past pizza. In the summer, tables spill out into the garden, and you’ll want to, too. Dessert: Brooklyn Farmacy – This adorable soda fountain makes spectacular ice cream sundaes, but even if you’re not feeling your sweet tooth, you must come for an egg cream. Typically, this local treat is made of milk, seltzer (the sharper, the better), and U-Bet chocolate syrup, but Farmacy also makes coffee and maple versions as well as a butterbeer variety for Harry Potter fans. Tip: Think that old saying that “good things come to those who wait” is tedious at best? 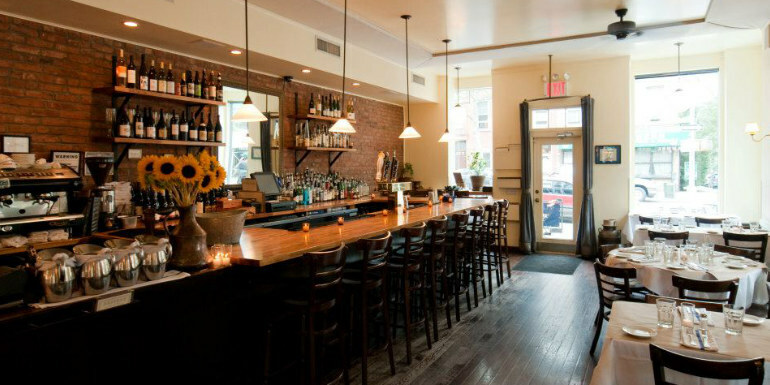 Too bad — if you have little patience, dining in Brooklyn will be trying. Most popular spots don’t take reservations, so you’ll need to go early, and order drinks at the bar while you wait. For everyone: Brooklyn Bridge Park – Walking across the Brooklyn Bridge has long been a favorite activity for locals and tourists alike, but with the development of the Brooklyn Bridge Park, it has become even better. Now when you get to the Brooklyn side, you’ll find great food (including Blue Marble Ice Cream and Calexico Carne Asada tacos) plus a pool, kayaks, and a carousel. In the summer, the park hosts free outdoor movies on Thursdays; on Sundays, check out the Smorgasburg food market. 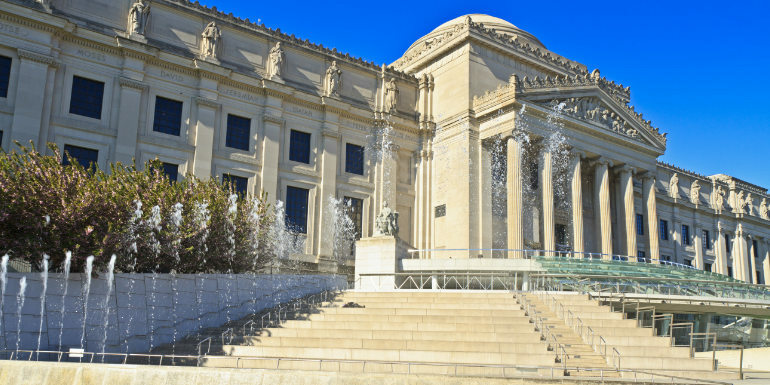 Brooklyn Museum – Like the borough itself, this world-class art museum has come into its own in the last decade. Housed in a Beaux-Arts building at the edge of Prospect Park, right near the Brooklyn Botanic Garden, the three sites make up the trifecta of tourism. Check out the museum’s free Saturday night events. For couples: Brooklyn Heights Promenade – Seen a beautiful picture of Manhattan in an ad or commercial? Chances are it was shot from here, on the elevated walkway. Come in the evening and stroll around the brownstone-filled historic neighborhood, ending at the Promenade for a photo op with Manhattan’s twinkling skyline. Stick around to watch the sun set behind the skyscrapers. For families: Brooklyn Botanic Garden – What the garden looks like depends on the time of year. Our favorite: Late April and early May, when the cherry blossoms wash the landscape in pink. You can let the kids run around for a while and, from April through September, the garden hosts drop-in workshops for families. For the adventurous: Luna Park – Coney Island’s famous beachfront amusement rides survived Hurricane Sandy, and the park reopened in March 2013 with both the iconic Wonder Wheel and the Cyclone, a wooden roller coaster. Tip: Barclays Center, home to the Brooklyn Nets basketball team and a variety of boxing matches and concerts (by stars like Alicia Keys, Justin Bieber, Billy Joel, Paul McCartney, and Beyoncé), is the biggest landmark to open in decades. Want tickets? Check the calendar as soon as you book your cruise. Brooklyn is the original melting pot, and one of the best places in the country to sample a variety of ethnic cuisines. If you have extra time to explore, consider picking up a copy of "The Food Lovers’ Guide to Brooklyn," which I wrote. The book takes you neighborhood-by-neighborhood through each community — from Jamaican jerk chicken to Polish pierogi. What are your favorite places to go in Brooklyn? If you're checking out the Botanical Gardens or the Brooklyn Museum, be sure to head over to Prospect Park for an afternoon stroll. It was designed by Olmsted and Vaux, the same team that designed Central Park in Manhattan. Strangely enough, even though more people know of Central Park, Prospect is considered their crowning achievement. You'll see why once you've walked for a few minutes and no longer feel like you're in a city! Barclays Center is all shiny and new, but the biggest bang for your sporting buck has gotta be a Cyclones ballgame in Coney Island.